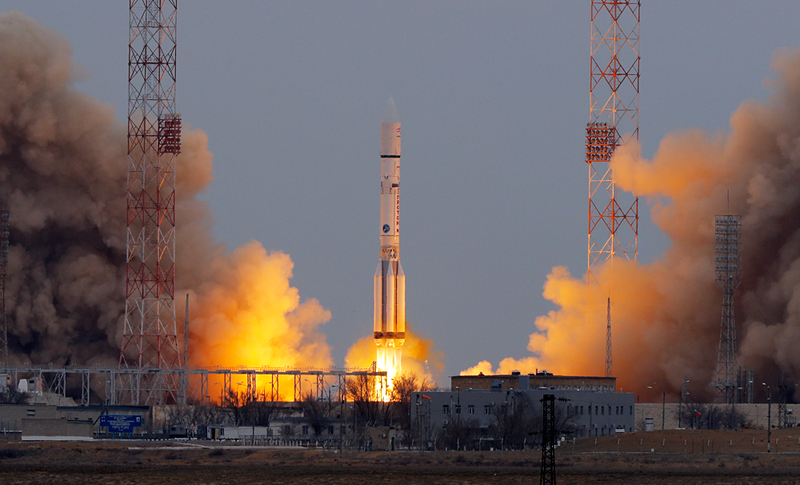 A Proton-M rocket carrying the scientific interplanet station ExoMars was launched from Baikonur Cosmodrome on March 14, an Interfax-AVN correspondent has reported. The launch took place at 12:23 p.m. Moscow time. ExoMars 2016 is an astrobiology mission by the European Space Agency (ESA) in collaboration with the Russian Federal Space Agency (Roscosmos). The ExoMars mission involves two space vehicles: the Trace Gas Orbiter (TGO) that will analyze the composition of the Mars atmosphere and transmit the relevant data to the Earth and the Schiaparelli landing module that will practice maneuvers to enter the Martian atmosphere, descend and land on the Red Planet. The ExoMars journey to the fourth planet from the Sun will take seven months. The ExoMars space vehicles are expected to separate on October 16 so that the Schiaparelli landing module can enter the Martian atmosphere on October 19 and the TGO can enter Mars' orbit. Read more: Who will join Russia on its journey to other planets?